Connective Mobile now has MMS (Multimedia Messaging Service). This means that our customers can now send images, sound and video to their target audience in addition to longer text messages… and it won’t cost you or the end user anything additional to do so. As the old saying goes, “a picture is worth a thousand words”. 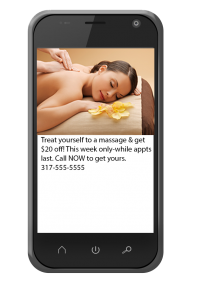 Sending an image along with text allows our customers to engage even more with their fans. Restaurants can send an image of a new dish that they are offering just before the lunch or dinner hour to help people make their meal decision. Retail can send an image of new or popular items. Spas can help clients envision treating themselves to a luxury treatment. Doing a text promotion at an event? Include a sponsor logo in your messaging. We have already seen some great MMS campaigns. How will you use MMS? With Mobile Marketing being so new and misunderstood we thought it might be a good idea to define some of the common mobile marketing terms in use today. Often customers and prospective customers will ask us if we can send pictures via text message or SMS. This almost always starts a conversation that ends with the other party feeling like another messaging provider has left out vital details that will greatly impact the decision of which provider to use.